The 10 Best Wineries in West Virginia! When you think of wine and wineries, West Virginia doesn't automatically come to mind, but the Ohio Valley was once a major wine-producing region prior to the Civil War. A severe blight destroyed most of the vineyards that grew there and essentially halted the growing of grapes and production of wines. Until recently, that is. West Virginia is quickly becoming known as the Napa Valley of the East with a climate that produces some of the sweetest wine varieties around. From high-end boutique wines to traditional Celtic meads, you'll find something to love. The wineries listed below will give you a small sampling of wines in Wild Wonderful West Virginia! In business for over 20 years, Forks of Cheat Winery in Morgantown, West Virginia, has become one of the largest award-winning wine producers in the state. With an onsite distillery, they now offer over 20 varieties of wine made from French hybrids and American varietal grapes. 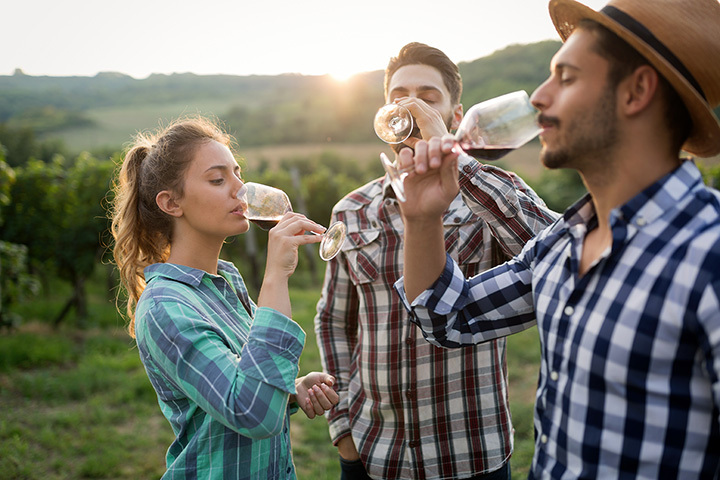 Complete with a large tasting room and rental space for events, vineyard tours are available in season, and visitors can purchase their favorite wines with custom labels. The winery is a little out of the way, but well worth the trip! You won't find a more beautiful venue for your special event than Daniel Vineyards in Crab Orchard, West Virginia. This family-owned estate vineyard and winery was once a golf course, but now boasts a 20-acre vineyard and three-acre blueberry patch. A great place to host weddings, business and community events, there is also an annual wine festival in the spring. Considered a "boutique winery," there are 14 varieties of wine such as Cayuga, Seyval, Norton, Sabrevois, and Marquette produced there. Daniel Vineyards has consistently won awards at all levels of wine competitions, and is recognized as one of the best conservation farms in the state. What started out as a hobby has grown into a vineyard and bonded winery that produces, processes, bottles, and sells delightfully sweet and fruity wines that appeal to almost everyone. There is no charge for sampling the wines and knowledgeable folks are on hand to guide you through the selection of wines ranging from dry reds to semi-sweet whites and blends. A small gift shop is on site that offers many things related to wine and wine-tasting. West-Whitehill Winery in Moorefield, West Virginia, is a diamond in the rough, but don't let this small winery fool you. The South Branch Valley area is known for having the ideal climate for growing grapes. Even if you're not a wine connoisseur, you'll have a variety of dessert wines from which to choose, such as Raspberry Royale, Classic Currant, and Mountain Spice. Wines are available on site, at various festivals throughout the state, or by mail order. Known for producing some of the state's finest table wines, Potomac Highland Winery in Keyser, West Virginia, has been harvesting grapes since 1992. One of the unique features of the winery's location is a late summer/early fall drought that intensifies the sugar content in the grapes, which provides sweet red and white wines. The small cost of tasting is deducted from your wine purchase, and you can have wines shipped directly to your home. Cox Family Winery in Bunker Hill, West Virginia, is the only winery in the Eastern Panhandle and has been recognized and awarded as "Best of the Best in Excellence" by The Journal. With experience making hard ciders and wine over several generations, this little winery offers rich fruity varieties like their original, a light amber-colored wine with a sweet taste made from Concord grapes or peach, a semi-sweet wine that is 100 percent peach and not blended with other fruits or wines. Nestled in the rolling hills of West Virginia and with a history of making moonshine, Heston Farm Winery has been legally delighting visitors since 2011 by creating a welcoming atmosphere and simple wine and whiskey selections. With a restaurant on premise, The Foxfire, farm fresh food grown on the farm's 200 acres are combined with the culinary skills of their celebrated chefs, and plans are underway to expand the property as a private and public venue with a focus on agri-tourism. A mead is an alcohol made by combining fermented honey with various fruits, spices, and grains. The only winery in the state to produce mead, Mountain Dragon Mazery in Fairmont, West Virginia, has eight different meads all made with local honey to tantalize your taste buds. This unique winery is also the only producer in North America of a Celtic mead called Morat, made with apples, oranges, nutmeg, and honey. Free tastings and a great way to learn about the ancient craft of mead-making. Black Satin Blackberry, Moonglow Pear, and Wild Elderberry wine, the state's only produced bourbon, and 90-proof moonshine are just some of the libations that can be sampled at Kirkwood Winery in Summersville, West Virginia. The first winery in this area of the state, this winery's distinction is that they make vegetable wine! That's right! If you want to send your taste buds on a wild roller coaster ride, try the Appalachian ramp, dandelion, and strawberry rhubarb wines. And if that's not adventure enough, try their famous Ginseng wine. One of West Virginia's newest wineries, Batton Hollow Winery in Lost Creek offers annual seasonal and very popular favorites such as Primavera, Summer Breeze, Autumn Glory, and Winter White. The winery also has a selection of beers for those who don't drink wine, making this a great place for family events and community gatherings. View more West Virginia Wineries & Vineyards.